The Fabulous Man and I were sitting on the couch a couple of nights ago watching the Olympics, and he said: "I bet if we start practicing now, we can go to the Winter Olympics in 4 years. Let's take up curling." Now, I don't wish to offend anybody, but I agree that that sport looks way too easy. Fun, but easy. So we started to make plans, mainly looking around Google to see if anybody in Australia (or South Africa) actually plays the sport, because how good will it be to win a gold medal in anything really, especially curling. Then I came across something much more up my alley: the BloggerAid Culinary Olympics. And I realised that the sport I am best at is Food. I'm good at it. I'm good at reading recipes, I'm good at looking at foodie blogs, I'm good at shopping for ingredients. When it comes to the cooking bit I'm probably more at a thank-you-for-participating level rather than medal-winning ability, but the eating part is right back at gold. I'm especially good at eating. The best part is, I get to represent two countries, my native South Africa, and my adoptive Australia. People always ask me which country I prefer, but honestly, it's like asking if I prefer chocolate or sandwiches. Both are perfectly nice in their own way, and I don't think it should be necessary to chose, do you? So, first into the arena: South Africa. My mother country is a melting pot of cultures and traditions, and you will find anything from high tea with scones and clotted cream to a fiery Indian curry. Our vibrant Cape Malay culture provides fabulous dishes like bobotie, which is curried meat with bread and fruit, with a savoury custard topping. Another favourite among South Africans is the braai, or barbeque, done over coals from wood. Charcoal if you have no other choice, but never gas. Never ever. At a braai you'll find all kinds of meat, including a variety of game. If you're lucky there will be some boerewors, or farmer's sausage, which is beef sausage flavoured with some spices, and sosaties, marinated meat on skewers made mostly with lamb, but also beef, chicken and game. But the one food that is uncompromisingly South African, and which all South Africans crave when in another country, is biltong. In my first post I told you a bit about this fabulous food, and promised a recipe. And I think this is the perfect platform to showcase a recipe with biltong as its star. Mostly we eat biltong as is, usually while watching the cricket, maybe washed down with a beer. You can also have it on sandwiches or in a salad. I have even seen biltong sushi, and pizza with a biltong topping. For the olympics I wanted to try something new, and decided on a biltong ravioli. I made a biltong and ricotta filling, and dressed the ravioli in a sage butter sauce. And people, dear people, this was absolutely as delicious as it sounds. I couldn't get enough of this, and happily had the leftovers for breakfast the next morning. Even the Fabulous Man, who doesn't really like biltong, said it's the best dish I've made so far. High praise indeed. I hope the judges like it too. If you don't have access to biltong, you can substitute it with prosciutto. Don't be tempted to up the amount of biltong. It doesn't look like much, but remember that a little goes a long way. I chopped the biltong very finely, but I also think it will work if you process the biltong and the ricotta together to get a finer texture. I don't have a pasta roller, so I bought some excellent ready made pasta. Please feel free to use your own favourite pasta recipe if you want to do it yourself. Mix the ricotta, biltong, egg yolks and pepper together in a bowl. Don't use salt, as the biltong is already quite salty. Cut out your desired shapes from the pasta (I used squares, but circles are good too). Place a spoonful of filling in the centre of your shape, and paint the edges with some water. This step is important as it prevents the filling from leaking out. Either cover your filling with another shape, or fold your existing shape over the filling. Press the edges together, making sure you press out a much of the air as possible. You can make the ravioli in advance up to this step. Place the ravioli pieces on a baking sheet and put it in the fridge. Cook the ravioli in boiling water until done, about 5 minutes. While cooking the ravioli, melt the butter in a saucepan until golden and frothy. Toss in sage leaves, cook for another 2 minutes. Toss the cooked ravioli in the sage butter, and top with shaved parmesan and biltong. Do you know about the work that BloggerAid Changing the Face of Famine (BACFF) is doing? At the moment they are hosting the H20PE for Haiti online raffle, which has been extended to March 7th. Read my post about it here, head over to Cooksister to see the list of prizes, and then to the JustGiving donations page to buy some tickets. They go for only $10 each, and prizes are shipped internationally. I have donated a wonderful book called South Africa Eats, showcasing South Africa's culinary traditions and cultures, but there are many wonderful prizes on offer. Another way to support BACFF is to buy the BloggerAid Cookbook where 100% of the proceeds target children and education through the World Food Programme called School Meals. Purchases can be made here. I'm always amazed about how something as little as $10 can make a big difference in somebody's life. If you feel inspired to help, please do, otherwise please support your own charities. Every little bit helps. Curling is one of the only winter events England ever wins! (Say no more.) It always makes me laugh that it is actually classified as a sport. 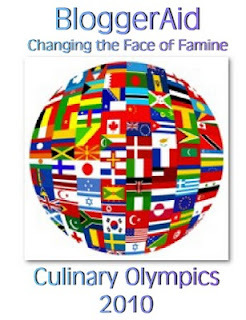 Anyway Culinary Olympics sounds much more fun. Thanks for including the link to the Haiti online raffle. I have now donated. I always learn something new when I am out in the blogosphere. I would win a Gold at eating this dish that reminds you of home as well!!! Inspired!!! This looks totally divine - thanks for giving me ideas (although hubby will definitely object to "wasting" biltong in pasta ;-) As for curling... are we SURE it's not a game that Terry Pratchett made up?! Does anyone have the recipie for biltong sushi? Alexandra, I couldn't find anything official, but I imagine you could make a nice nigiri with a thin slice of biltong, or even incorporate it into a rainbow roll. Just replace any fish you'd use with biltong. Hope it turns out great.